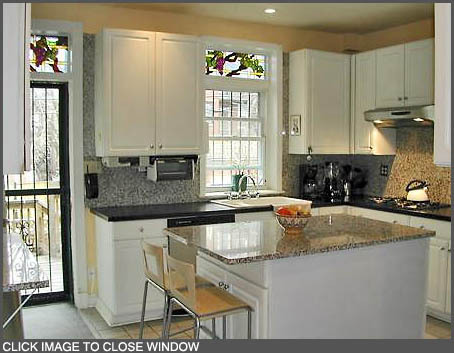 The kitchen area features a Sub-Zero refrigerator and stainless steel oven and dishwasher, gas cook top, granite counters and backsplash, exposed brick walls, ceramic tile flooring, recessed lighting, built-in microwave, extra storage cabinets and beautiful stained glass windows looking out to the property's patio and deck. The adjacent dining room is 12x18 feet and can easily seat 10 or 12 people. It features recessed lighting, oak floors, a beautiful historic fireplace mantel and classic pendant lighting. The sun-filled living room is 16x30 feet; open and airy. 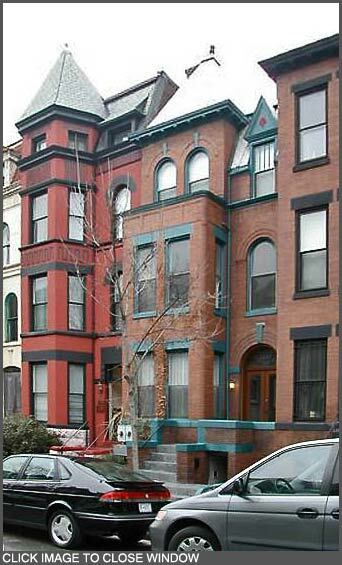 It features south-facing bay windows, classic heart pine floors, a gorgeous built-in bay window day bed with custom cushions and storage cabinets, recessed lighting, a working fireplace with grand historic mantel, custom built-in shelving with plenty of storage, and a black granite-topped wet bar with maple cabinets enclosing a microwave oven and refrigerator. The adjacent stone-tiled master bath features a custom shower made of tumbled limestone and frameless glass door, tumbled limestone flooring, Kohler fixtures, and a separate Jacuzzi tub. The second bedroom is adjacent to a full bathroom and wet bar area and features heart pine wood floors, ceiling fan and closet. 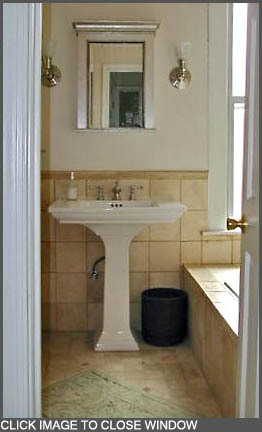 The bathroom features tumbled limestone flooring. 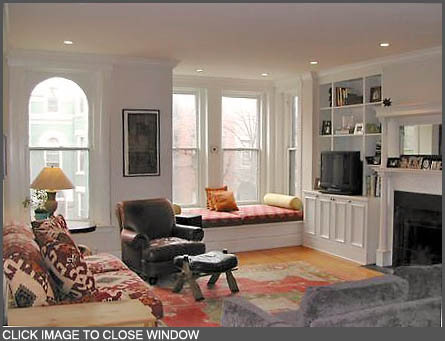 This bedroom leads to its own sun porch with picture windows and an exposed brick wall. The sun porch can be used as an office, reading room, guest room or play room. The third bedroom features recessed lighting, excellent custom closets with storage nooks and recently installed high-grade wall-to-wall carpeting. Immediately adjacent to this bedroom is a full bath featuring classic black and white ceramic floor tile and a bathtub with a white ceramic tile surround. The fourth bedroom is ideal for use as an office or guest room. This bedroom features generous built-in shelving, fine oak floors, French doors with blinds, a classic fireplace mantel for architectural appeal and a fabulous day bed in its bay-window nook that features a hidden, built-in pop-up convertible trundle bed. The property's outdoor area is ideal for eating, hosting, and children's activities. This area features a wood deck just off of the kitchen and has a stairwell leading to a ground level outdoor patio with slate flooring, exterior lighting & a lovely fenced-in eating area that is ideal for entertaining and dining al fresco! 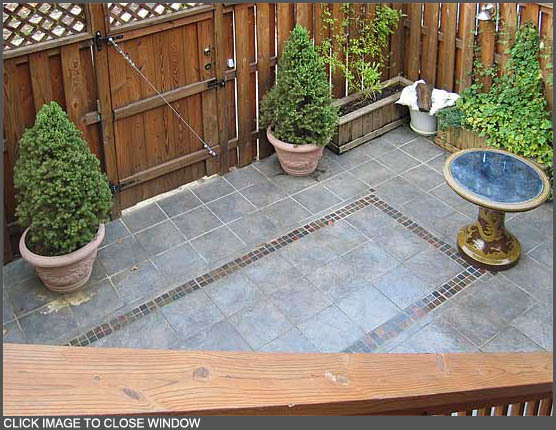 This patio leads to a parking area for up to three cars (the number of parking spots is subject to availability and vehicle size). A separate one bedroom, one bathroom In-Law apartment with separate utilities and its own laundry facilities is also available to be rented either separately or along with the main house.